The Obstruction of Action by the Existence of Form, 2012-13, color video with sound, 8 min. 32 sec. The Obstruction of Action by the Absence of Other, 2012-13, color video with sound, 4 min. 45 sec. 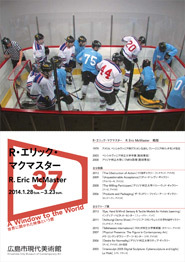 R.Eric McMaster’s The Obstruction of Action series depicts athletes of various types unable to play their sports properly due to the imposition of obstacles, such as in The Obstruction of Action by the Existence of Form where he packs 12 hockey players and a referee into a tiny rink just 18 feet long and 12 feet wide and has them attempt to compete. This and other works in the series convey the humor and poignancy of players continuing to go through the motions of their sport despite a situation that renders it impossible, the players’ and referees’ actions, uniforms, gear, and other elements stripped of meaning and the entire exercise reduced to a farcical and incoherent charade. These works call attention to the fundamental absurdity of protocols and institutions such as those governing both players and spectators in the world of sports. McMaster was born in 1979 in Clarion, Pennsylvania and is currently based in Austin, Texas. He graduated from the Pennsylvania State University with a BFA in sculpture and later earned an MFA in sculpture from Arizona State University. Currently he has a joint position as a lecturer and Digital Fabrication Lab Manager at Art + Art History Department, University of Texas. Focusing attention on sports as systems that both incite and restrict human behavior, he produces sculpture, video, and photographic works exploring these themes which he has exhibited in numerous venues in the United States and abroad.